Tribes Hill Presents Kindred Folk, a monthly series presenting the finest Hudson Valley singer songwriters. I will be sharing the stage with Alyssa Dann and Bill Kelly. Performing a half hour set at this spectacular museum dedicated to the work of self-taught artists. In a way, I feel right at home! Not only is the music free, but admission to the museum is free. Back at the fantastic Pleasantville Farmers Market. Playing for two hours, 10 to 12.
hosted and sponsored by Stuart Kabak. In the round show with Tribes Hill member performers including Larry Kolker, Judy Kass, Karen Hudson, George Gierer, Fred Gillen Jr. Community Church of New York U.U. 40 East 35th St. (between Madison & Park) New York, NY, 10016 Cafe entrance at far right of building, at street level. TIMES: All shows start at 8 PM, Saturdays. Doors open at 7:30. No reservations, so come early to be assured a seat. ADMISSION: $20 suggested contribution -- more if you choose, less if you can't; no one turned away. For PVC subscribers the suggested contribution is $12. Yup, start time is 8:30, you read it correctly. I play till 11:00.
including apparently, a local distiller. You can be sure I'll be playing Brown Eyed Women! Bet you didn't know I have TWO hickory trees in my yard, didya? I am so honored to be playing in John Platt's storied and special showcase series at Stage 3 of Rockwood Music Hall. John is a tireless champion of independent musicians everywhere, with a broad and deep understanding of musical history and influences. This will be a really fun night! I am sharing the evening with two terrific acts. First, Bill Scorzari www.billscorzari.com, an Americana artist from Long Island. Seating is very limited, so advance purchase is highly recommended! And you needn't be local to listen, it streams on the web! A Taste of Danbury on Fairfield Hall Lawn. Jeff Eyrich joins me on the air at WPKN with host Jim Motavalli. We'll be talking about Mostly Fine, spinning some tracks and playing some tunes LIVE!!!! Thirty minute song swap with my great pal Judy Kass! Delighted to be invited to play again this year at the venerable Pleasantville Farmer's Market. Peter Calo accompanies me. We'll be playing selections from my soon to be released fourth CD as well as some choice covers and some old favorites. Hope to see you there! This is a cobill with Fred Gillen, Jr., Judy Kass, Matt Turk and duo Pluck and Rail. It's a benefit concert to raise funds for the Center for Food Action. CFA is a group that was originally founded by Harry Chapin as World Hunger Year NJ back in 1976. The non-profit organization now distributes over 70,000 emergency food and holiday packages to local families and individuals each year. They are an important resource and advocacy group that fights hunger and homelessness in Bergen County, where the numbers unfortunately keep growing each year. You can read more about them at www.cfanj.org. Hurdy Gurdy Folk Music Club is probably New Jersey's most venerable folk club, going thirty years strong, and I am most honored to take the stage there! It is run by Ron Olesko, who also DJs WFDU's "Traditions" show. I am honored to be asked return again to The Pleasantville Farmers Market, the largest farmers market in Westchester, and voted best market in Best of Westchester 2014 by the readers of Westchester Magazine. It's right in the center of Westchester County, and in the heart of a beautiful, historic walking village. It features more than 50 new and returning farmers and food artisans who bring healthful, regionally produced food to our community, and the thousands of people who come each week to support local agriculture, support neighboring businesses, shop for their families, and enjoy the delicious good time. There are also AWESOME flower growers who sell gorgeous fresh flowers-you know how I love flowers! The amazing Peter Calo will accompany me again this time. one of the Hudson Valley’s most sought after bass players, Jeff Eyrich. Bedford Rd. and Katonah Ave. I am so thrilled to be included in an “Afternoon of Music and Light.” This is a fundraiser for the Northern Westchester Emergency Shelter Partnership. Nationally and internationally recognized musicians, led by professional guitarist and composer Jim Skinger, will play a mixture of classical music and jazz. Guest artists to perform will include Ericka Schlenkermann on flute, Delia Montenegro on oboe, Claude Preece on bass, Joe Stamboli on trumpet, Doug Malfer on keyboard, and Rob Lamborn on trombone. I will be doing a set of my songs. A $10 individual donation is suggested, $25 for families. All proceeds will benefit the Emergency Shelter Partnership (ESP). Immediately following the concert, St. Luke’s will host a reception in its parish house next door to the church. For more information, please call St Luke’s Church at 914-232-5220 or visit www.stlukeskatonah.org. there have been no reports of deaths from exposure to the winter cold. and bassist Scott Fragala for an evening of original music with a sprinkling of covers. Larry Kolker is also on hand to deliver a few songs. I am SO pleased to return to The Pleasantville Farmers Market, the largest farmers market in Westchester, and 33rd largest in the United States. A 2013 Farmland.org survey named it the most celebrated market in New York. 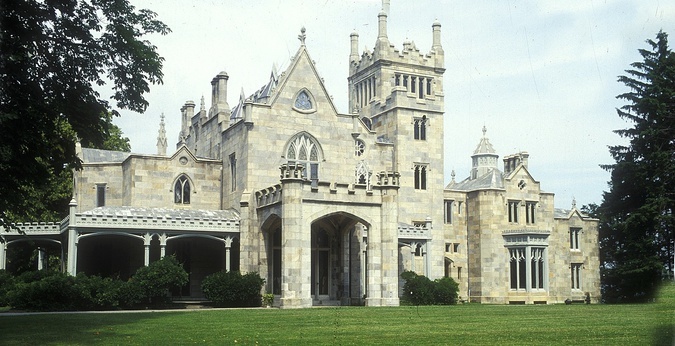 It's right in the center of Westchester County, and in the heart of a beautiful, historic walking village. Pleasantville Farmers Market has also been voted Best Of Westchester by the readers of Westchester Magazine. It features more than 50 new and returning farmers and food artisans who bring healthful, regionally produced food to our community, and the thousands of people who come each week to support local agriculture, support neighboring businesses, shop for their families, and enjoy the delicious good time. There are also AWESOME flower growers who sell the most beautiful field fresh flowers ever-you know how I love flowers! $10 is admission to the Craft Fair, a well known juried craft fair with many wonderful vendors, including lots of great food!. Event is rain or shine! There will be a covered listening area. Peter Calo accompanies me. Great to be back at this fine venue! on the plaza at the Grace Building, across the street from Bryant Park and THE library of all libraries. Playing a set of an hour and 15 minutes--my songs plus a selection of Gram tunes. other locavore stuff and hear some music! I'll be on the air live with Jim Motavalli at the WPKN studios in Bridgeport. This is how Jim describes his show: "A mix of environmental and author interviews with jazz, folk, blues, country (especially older forms), Americana, world and techno/ambient music. Live music is featured. I try not to repeat myself too much. Each show is a clean slate. Don’t expect the warhorses; expect the unexpected. I also don’t talk all that much, unless I have an interesting musical or author guest." Eric Puente on drums, and Sarah Banks on fiddle! I'll be in the studio with Joltin' Joe, the Mad Scientist, who will be playing some tunes from A Word Child. He'll also be interviewing me and I will play some stuff live. Thanks to technology, the show streams, so tune in from wherever you are! Kathy will also play "New York Winter"
5:00 PM to 8:00 PM: enjoy Birdsall's fantastic craft beer and locavore artisanal food while Steve Kirkman and I take a walk through our songbooks. 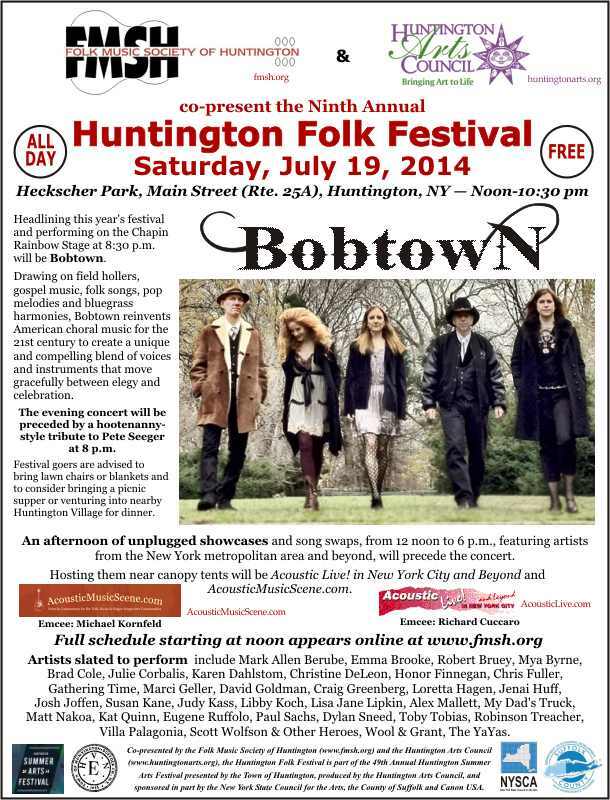 The seventh annual Huntington Folk Festival is slated for Sunday, July 22, 2012. The free event will extend from 12 noon into the late evening at Heckscher Park, Main Street (Route 25A) and Prime Avenue, in Huntington, New York. Headlining this year’s festival will be the artists who are part of the Falcon Ridge Most Wanted Tour. Pesky J. Nixon, ilyAIMY, Louise Mosrie and Blair Bodine – who were voted “Most Wanted to Return” by Falcon Ridge Folk Festival attendees last year following its annual emerging artists showcase – will perform on the Chapin Rainbow Stage, beginning at 8:30 p.m. An afternoon of unplugged showcases and song swaps featuring artists from the New York metropolitan area and beyond will precede the concert. Hosting them near canopy tents, from 12 noon to 6 p.m., will be Acoustic Live! in New York City and Beyond and AcousticMusicScene.com.The afternoon festivities will conclude with a hootenanny-style musical tribute to Woody Guthrie. Co-presented by the Folk Music Society of Huntington (www.fmsh.org) and the Huntington Arts Council (www.huntingtonarts.org), the Huntington Folk Festival is part of the 47th Annual Huntington Summer Arts Festival presented by the Town of Huntington, produced by the Huntington Arts Council, and sponsored in part by the New York State Council for the Arts and the County of Suffolk. 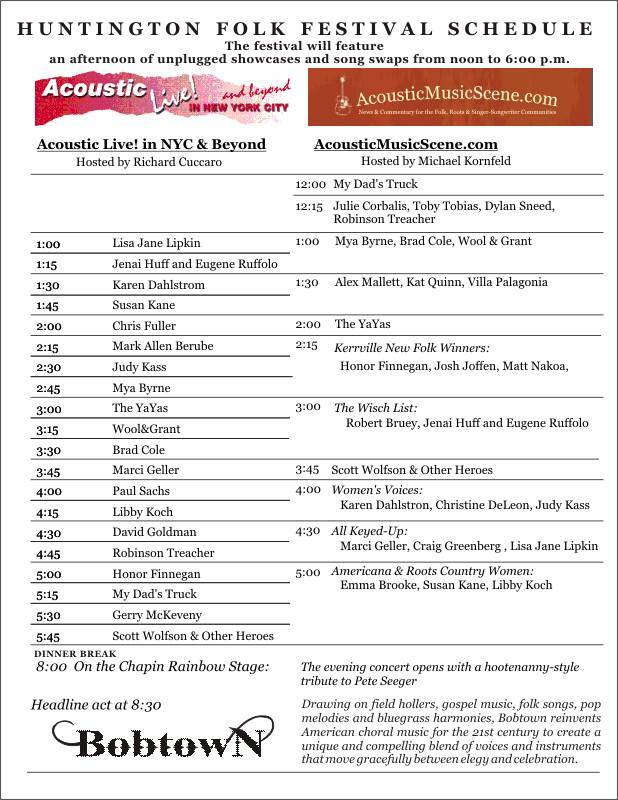 I will be performing a short solo set at the AcousticLive! tent at 2:30, and then in the round for 30 minutes at 3:30 at AcousticMusicScene with Loretta Hagen and Claudia Nygaard. This is the second broadcast. Catch me on Vinny Cohan’s show broadcast on WDFH-FM 90.3 in Ossining and streaming on the web at www.wdfh.org, 9:00 PM on Wednesday, May 9 and again on Tuesday, May 15 at the same time. So wonderful that you don’t have to be local to be able to listen!! WDFH-FM 90.3 in Ossining, Westchester County, New York, is community public radio for New York's lower Hudson River Valley, and is Westchester’s ONLY public radio station. They have fantastic programming and are extraordinarily supportive of local musicians—I am just one of many artists who have visited their studio. They are entirely nonprofit and noncommercial. Their music programming includes a freeform mix of progressive and alternative rock, jazz, blues, and folk. The station is also deeply committed to news, public affairs and social justice issues. Catch me on Vinny Cohan’s show broadcast on WDFH-FM 90.3 in Ossining and streaming on the web at www.wdfh.org, 9:00 PM on Wednesday, May 9 and again on Thursday, May 15 at the same time. So wonderful that you don’t have to be local to be able to listen!! Open mic at 8:00. I take the stage at 9:00 with Steve Kirkman and Eric Puente. Sharing the evening with the series' wonderful host, Honor Finnegan and the Levins. Come and finish up your Thanksgiving recovery! We promise we will not serve any leftover turkey, gravy, stuffing, green bean casserole, sweet potatoes with marshmallows, or mashed potatoes. Not even pumpkin pie. And no family drama! But lots of good tunes. Paul Sachs joins us. You should, too! In the Round, or something like it, with KJ Denhert and Lara Herscovitch. Preceded by open mike open to Tribes Hill members. See www.tribeshill.com. Come and get the best of late summer local produce and goodies. Opening for the Sweetback Sisters.